At fourteen years old, Sherlock Holmes thinks he is facing a boring vacation in exile. His brother Mycroft sends him off live with his eccentric Aunt and Uncle and study beneath an American tutor named Amyus Crowe. Instead of boredom, he finds himself confronted with his first mystery, a new friend, and relentless enemies. Even if he manages to escape with his life, Sherlock’s life is changed forever. In my personal opinion, the adventure element in this book (and book two of the series) far outweigh the mystery element. But, it’s Sherlock Holmes, and you can’t go wrong with Sherlock Holmes when you’re doing a mystery theme. Besides, 240 people classified it as a mystery on Goodreads, so we’re all good. 🙂 I really enjoyed the fast action of this story, and the glimpse of Sherlock as he might have been as a boy. 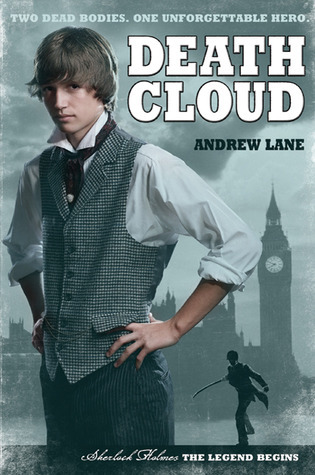 I tend to doubt this version of young Sherlock is quite what all you BBC Sherlock fans imagine, but I bet you’d enjoy the book anyway. After all, the author is English and, judging from his author bio, seems to have a thing for BBC TV shows. P.S. If the weird and slightly grotesque bother you, this book might not be for you. There’s nothing over the top, but it’s worth the warning. What is your favorite Sherlock Holmes story, whether from the original books, old movies, BBC Sherlock, or side shoots like this. I’m not sure I could pick a favourite story… I read the original books first, and from there I think my favourite would either be “The Adventure of the Speckled Band”, “The Adventure of the Copper Beeches” or “The Final Problem”. I’m also a huge fan of BBC’s Sherlock. 😀 I haven’t seen many of the old films, but I love what I’ve seen of Jeremy Brett. I also really enjoy John Stanley’s adaption of Holmes in the old Sherlock Holmes radio show. Okay, his hair looks just way too modern. I like the books best (I can’t decide which is my fave though!) and have only recently started venturing into movie versions found via the library or youtube. Lots of experimenting but I like Jeremy Brett’s take.